Are you currently looking to upgrade your pillow? Well, if that’s the case, we are here to introduce you one of the best options currently available. The Purple pillow is made by a highly reputed company which was initially into making mattresses only. Nevertheless, it takes advantage of patented hyper-elastic materials made of polymer to make sure that their sleeping solutions are of the highest quality. This results in cooler, responsive and very supportive overall appeal which is most certainly something that you ought to keep in mind. 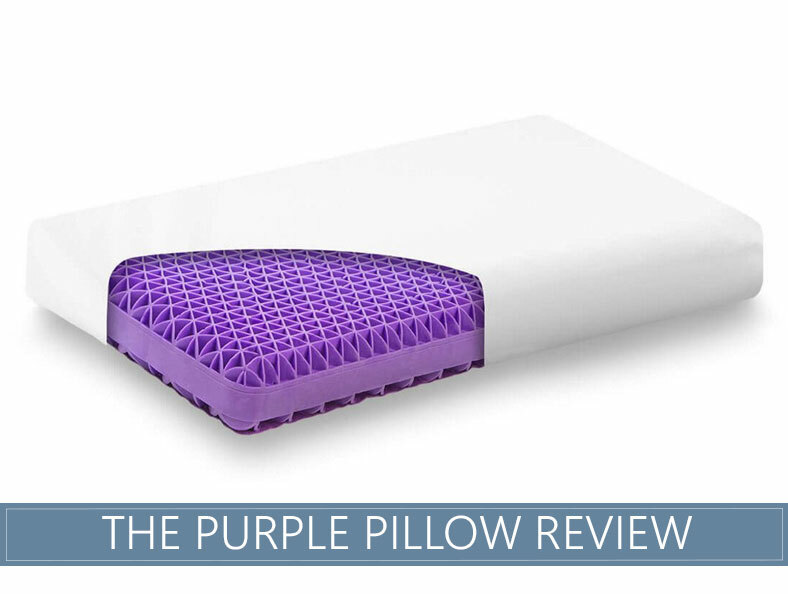 Let's waste no time and jump straight into our Purple pillow review. If want to explore more options then be sure our Best Pillow buyer's guide. Starting off, the construction of this pillow is rather interesting. The materials that are used for its making include 2% polyester as well as 98% polymer which is hyper-elastic. The outer coating is made out of a boosting PVC which is capable of being inflated. This is going to allow you to easily achieve the desired height as per your personal preferences and sleeping habits. If you are familiar with the mattress made by the company, you will probably pick up that their pillow is also constructed in a very similar manner. It takes advantage of smart grid technology which is rather rigid thanks to the hyper-elastic polymer used in it. The material is specifically designed to conform to your head and your neck (see our neck pain pillows). This happens every single time you lie down on it. What is more, the shape is going to be retained, and it’s not going to get lost – this is something very important as well. The polymer also has very breathable and high cooling properties, increasing ventilation quite substantially. The sleeping surface is likely to remain properly cooled off throughout the entire time. Also, the Purple booster is also going to add more ventilation. The adjustable height is designed in a manner which is capable of accommodating side, back as well as stomach sleepers and it could be removed if you need to. Pillow covers play a role that’s far more important than the covers of the mattresses. It is made out of spandex, bamboo, and polyester. These materials are specifically combined to ensure that you get a plush casing which is going to enhance the overall properties of the comprehensive construction, add more breathability as well as flexibility. From an aesthetics standpoint, the cover is entirely white, and there is one purple zipper which would allow you to remove the entire interior portion of the unit. This allows for easy cleaning and drying of the cover itself. The solution is 100% machine washable. The truth is that the feel of the pillow is quite formidable. Thanks to the comprehensive materials as well as the overall composition, the pillow adds resilience, softness, quick response times and a very cool surface. That’s usually what the majority of people would be looking forward to. The exterior polymer material is specifically intended to relieve serious pressure and to support the feel brought by the firmer core and the firmer edges. You will feel a slight cradling, but that’s not as pronounced as you may think and it would certainly prevent pressure point formation. The only slight drawback that we are capable of identifying at this point is the lofty sensation of the pillow when you are sleeping on your stomach. However, when you inflate it a little bit more through the booster, this goes away, and the height becomes just as appropriate as you will need it to. The overall feeling that is brought by the solution is one of support, comfort and well-balanced overall sensation. Now, the pillow is free to ship throughout the entire country, and it comes at a fairly reasonable $99 price point. The initial off-gassing smell is slight and minimal, and it goes away in a few hours. The trial period is set to 100 nights, and the pillow comes with a 10-year warranty. It’s made out in the USA entirely, thus guaranteeing the high quality of the materials and the manufacturing protocols which have been put in place. 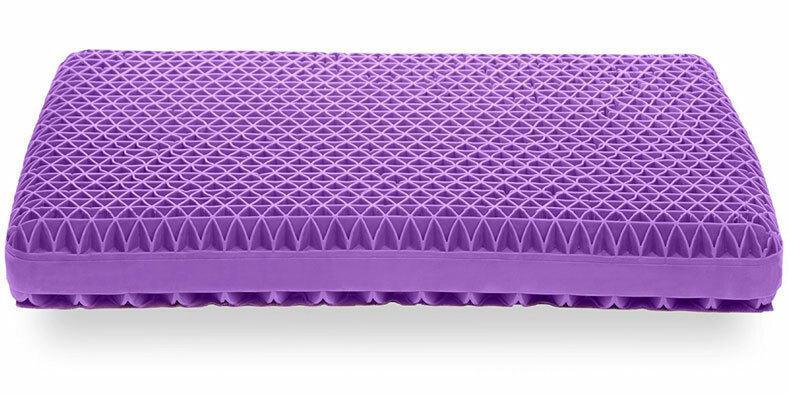 You want a pillow that’s very supportive – thanks to the smart-grid technology which is commonly implemented by Purple; you can rest assured that your head would be perfectly well supported throughout the entire time. The same goes for your neck. You are looking for an adjustable solution – the booster which is inflatable is particularly convenient. Not a lot of products come with this. You are not a fan of feathers – if you don’t like the feeling of feather or down, this product works well. It is made of highly efficient and responsive polymer materials, and that’s commonly used in mattresses as well. All in all, the Purple pillow is a very formidable and appropriate choice if you fall within the characteristics mentioned above. If you want to get a high-end option at a fraction of the price that it would typically cost you, this is a great solution. The product brings a range of different features, each one of which being particularly comprehensive. This is something that you should certainly keep in mind. It’s a great sleeping solution that’s going to guarantee that you receive a proper night of sleep and excellent neck support. 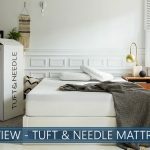 Tuft and Needle Bed Review - Is it Worth Buying? FYI: they don’t offer the air booster anymore. When I informed them about height issue they suggest a thin pillow underneath. Best pillow ever! Especially if you have neck pains! + PROS: Best pillow ever! Especially if you have neck pains!